The largest investment opportunity in history? Addressing a room full of senior fund executives and institutional investors, Al Gore gave an impassioned, rigorously researched talk yesterday about the horrific impacts of manmade climate change, and how capitalism itself might be reconfigured to offset the consequences. Set against the context of mass climate refugees, widespread disillusionment with the capitalistic status quo, and a recent global increase in freak weather events that have already claimed the lives of thousands of people (some of the footage is terrifying), the talk functioned partly as a wake-up call. Climate change, as Gore detailed through numerous increasingly unsettling slides, is already affecting both rich and poor all over the world, and if our socioeconomic infrastructure is not equipped to deal with it, society as we know it will come under severe strain. Many of Gore’s assertions are frightening. 100 million tons of pollution are pumped into our atmosphere every 24 hours. A football field’s worth of forest is being cut down every second. 18 of the 19 hottest years on record have occurred since 2001. And the socio-political implications are serious. 60,000 families fled Syria to Europe before the Civil War even began, because the climate had rendered their homeland uninhabitable. In the next 30 years, there may be 3.9m climate refugees from Central America alone. But Gore did have some good news for the fund managers and investment gurus that sat before him with rapt attention: the sustainability revolution is here, and has already been making big bucks. What’s needed now is a new approach to capitalism that will harness the human potential for radical change while ensuring reliable returns that do not “borrow from the future”. Gore, the former US Presidential nominee who re-emerged into the limelight in 2006 with his Oscar-winning climate change documentary An Inconvenient Truth, currently runs Generation Investment Management, which prioritises sustainable investments and long-term growth, and attempts to assess returns using different metrics to those more familiar to “quarterly capitalism”. During the talk, Gore used the analogy of the wavelengths of visible light: rather than focusing on the 0.0035% of the electromagnetic spectrum that we can see with the naked eye, we ought to start seeing the light we’ve been blind to. In the context of economic behaviour, this encompasses positive externalities, negative externalities, the depletion of finite resources, and the uneven, unpredictable distributional effects of socioeconomic activity – that is, the way both climate change and socioeconomic activity do not have linear, uniform and easily mappable effects. Expanding our horizons to consider such criteria need not be limiting: Gore describes it as “the single largest investment opportunity in history”. Gore, however, was stronger on generating waves of climate fear throughout his audience than on the specifics of the metrics of the new capitalism. How will such qualitative factors as “human capital management” and “corporate governance” be measured? What is meant by the considerations “ecosystem” and “degree of difficulty”, both listed as key considerations for investors on Generation Investment Management’s website? Gore also spent much of his talk discussing the great leaps made in the solar and wind energy industries globally – heartening, perhaps, but not the full story. The meat and dairy industries, for instance, account for 18% of our calorie consumption but 83% of farmland, and produce 60% of agriculture’s greenhouse gas emissions. Well-capitalised investors with increasingly diversified portfolios, in terms of both sectors and geographical reach, are well-placed to experiment with trying to reshape the landscape of global industrial agriculture, especially in rapidly developing economies where resources are relatively cheap and rapid-growth potential is high. Nonetheless, growth can still surprise us. As Gore pointed out, when AT&T commissioned a report by McKinsey & Co in the 1980s on the future of the mobile phone market, the prediction was that there’d be 900,000 mobile users by 2000. The eventual figure in reality? 109 million. Behavioural economics should be key to investment fund strategies, but even then, human impulses can be impossible to predict en masse – especially when connectivity and mimesis are involved. Sometimes the results are more amazing that any of us could have imagined; sometimes, then, investors may need to take leaps of faith. Other times, of course, the results are depressing. As Gore observed in another astute analogy, the subprime mortgage crisis arose from weak due diligence procedures and regulatory negligence that led to wildly overvalued assets, leveraged by the desperate optimism of millions of people. The exact same principle applies to what he called the “subprime carbon bubble”. According to Mark Carney, Governor of the Bank of England, most of the planet’s carbon reserves are physically unburnable. This does not get factored into carbon-based commodity valuations. These are global issues, and it is perhaps a relief that for years now, the largest funds have had no choice but to act globally to remain competitive. They can now act globally to be sustainable. Consumers communicate their needs in real time, as Gore points out, and investors need to be responsive – and since consumers, particularly in Europe but also elsewhere, are increasingly factoring their climate consciousness into their purchases, the investment landscape will be reshaped accordingly. With most governments also buying into the need for restructuring consumption, at least at the energy and plastics levels, the outlook for sustainable profits is sunny; let’s just hope we don’t get burned to a crisp first. 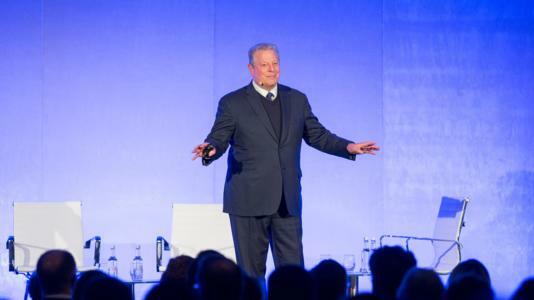 Al Gore was speaking at the 8th Annual Funds Congress, which was sponsored by Dechert LLP, Carne Group and PwC.